I've decided to publish PORT's look back at 2015 post after the first of the new year... partly because it is so extensive and partly because I don't like simple lists and everyone seems more receptive to reflection right after the new year begins. Before that, it is just kind of a popularity contest and people don't think too hard about the year when they are at holiday parties. Like the 2014 look back 2015 will be a doozie and not merely celebratory (another reason not to put a burn notice out on anyone on New Years Eve). I already published our top 10 most popular posts of 2015 here here as a appetizer. Here is Artnet's art world winners and losers list of 2015... notice how Jerry Saltz is in the winners list yet there was significant blowback at him at the beginning of the year? Lesson, good critics thrive on criticism. Killing off a critic with words and chest thumping is like trying to put out an erupting volcano with a forest fire. Fail. Kengo Kuma has been chosen to replace Zaha Hadid for Japan's 2020 Olympic Games stadium. Kuma is designing the new Portland Japanese Garden expansion which we spoke to him about here. Lately, Olympic Games have been saturated with immense cost overruns that take decades to pay off and what I like about Kuma is his sober focus on excellence rather than flash. Leave it to the Japanese to start fixing the somewhat broken Olympic system. Jonathan Jones is often wrong as a critic but he's right about the art world's turn to do-gooder morality art becoming stifling to the health of the art world. 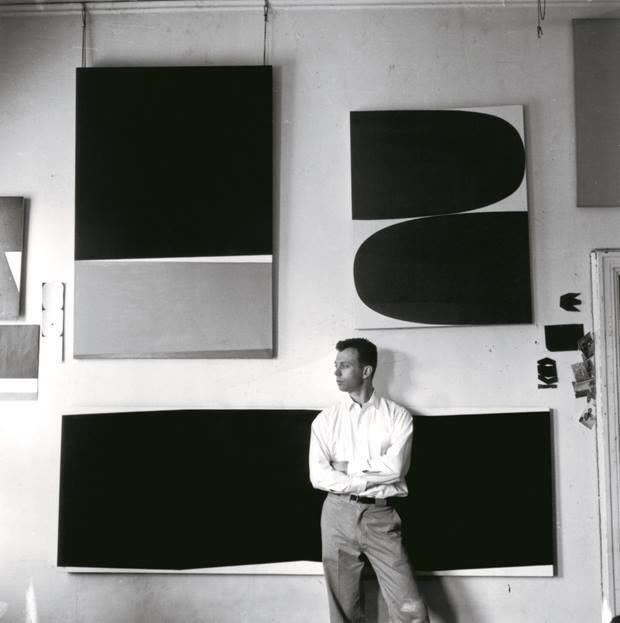 Art is not simply the illustration of our intentions, good or bad it is about exploring the amplitude of humanity's potential (which does have a dark side)... too much moralizing gets in the way of that. I also think his call for simple "rebellion" is just typical screed. Basically "rebellion art" and "radical art" are completely different critters and I'll take the latter. Rebellion is easy, you just point at something and say... that's bad (kinda like artists who think criticism is bad for them, it isn't). Radical thinking usually takes some brilliant thinking and makes room for even more approaches. The year is winding down so there are fewer events but the "Progressive" art galleries of Portland's downtown are having a little gallery crawl party today. I suggest starting at Melanie Flood Projects (420 SW Washington #301) from 3-5PM today. Bring food for the Oregon Food Bank. 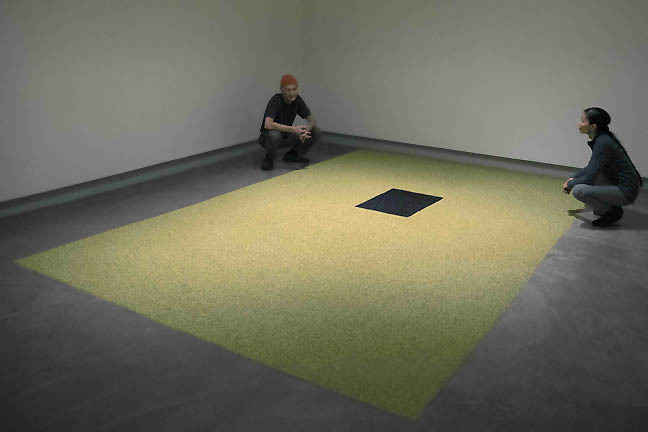 ...and from 5-8PM today there is a closing reception for Erik Geschke's Amalgam show at the North View Gallery. One of the best shows of the year. Last but not least there is a wrap party for the Jamison/Thomas 1985 redux exhibition at Jeffrey Thomas Fine Art. We normally don't shill for fundraisers but this silent auction supports the William Jamison Scholarships at PNCA (education is the one exception for our no fundraising rule). 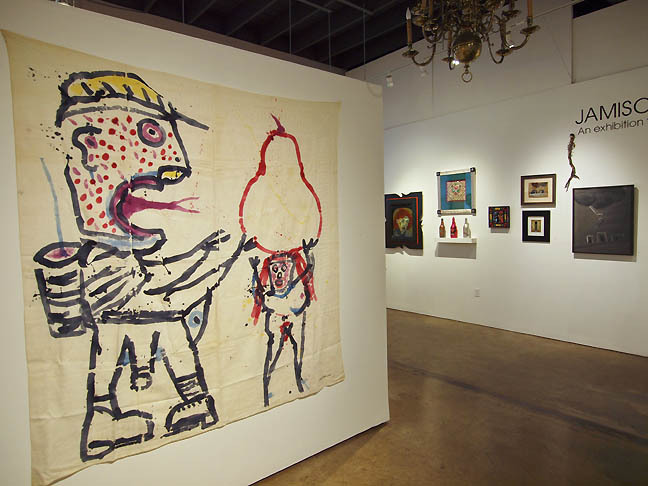 Overall, the exhibition has that incredible atavistic energy you saw in the 1980's. This timewarp show has all that high and low maelstrom, marinated in a punchbowl spiked with many things that still aren't legal. It is that time of the year again and everyone is doing their best of 2015 lists (PORT waits till just before or after January 1st to really dig into things and make it more than a list). Still, The New York Times and The Guardian are already making their lists. Jerry Saltz too. To my eyes, early 2015 seemed like a year where an impulse of "kill the King" reigned... where every major art impresario from Klaus Biesenbach to Jerry Saltz & Roberta Smith were thought of as passe. By the end of the year that sentiment had waned and yes it is good to be king... but it is even more important to recognize what gives certain people staying power as cultural voices. The great ones do get complaints, partly because they are great... even Great enough to make mistakes occasionally and STILL matter. Trolling the art world is a thing and some of this has little basis, some of this is hilariously valid. Jerry Saltz makes up with MoMA... kinda. It is true that most museums are experiencing a tremendous identity crisis these days trying to balance popular and serious pursuits but the real issue is how well thought out the new MoMA expansion plan will be. MoMA has deservedly received massive blowback for losing their edge and seriousness recently but the new building configuration will cement or correct those errors. Everyone is watching this (Jerry does not sound enthused after seeing the latest designs). This is all the more important since the Whitney and Metropolitan are both poised to usurp MoMA's place in NYC (and the world's) in the hierarchy of relevance. The thing is other museum's tend to follow their lead but I'm not convinced any of them are on the right track. Museums are in a difficult position as they occupy that difficult place between patronage, populism and relevance, the last seems to consistently get the short straw because the quality of and institutional trust in curatorial expertise has been slipping. As one of the artists in the excellent Alien She exhibition at PNCA and MoCC Tammy Rae Carland will discuss her multifaceted role as a voice for the more recent versions of feminism. Whether it is photography (sometimes for bands like Bikini Kill), zines or video art distribution she's been a force. We are just putting the finishing touches on a review for you. Till then here are some links. Kenny Schachter dishes on ABMB in a way that isn't just anecdotal fluff. But no, art history survives this because that is what history is... the survival of what mattered or will matter. Martin Puryear is one of those artists whose work seems to have always existed... yet it is made. There is poetic genius in that kind of approach. Christian Viveros-Faune on why Art Basel Miami Beach puts the cart before the horse then kicks the horse. True that this has been written a million times but this article gets at the meat of the matter. 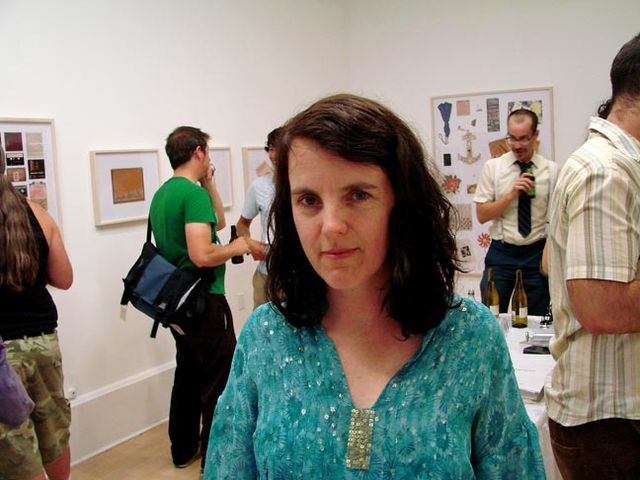 An idiosyncratic curator who likes to call herself "a director" because it is "more modest." Ok, I can't buy that but I do like the other aspects of her approach, which is mostly about giving artists what they need rather than the other way around. 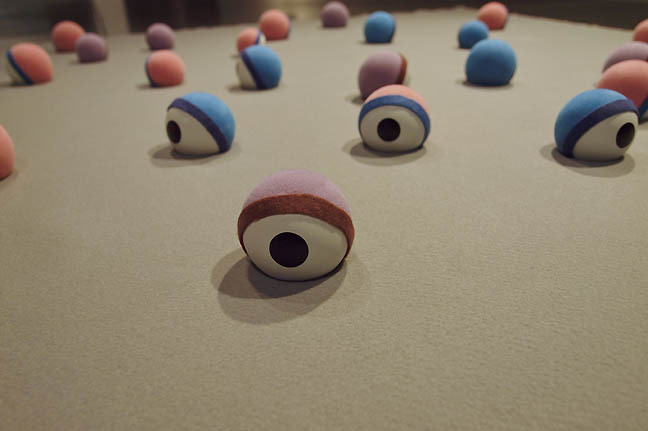 Jerry Mayer and Ellen George always seem to do something interesting with the Nine Gallery and Within Within featuring 200lbs of colored pearl rice looks like the most promising thing on display during First Thursday. Melody Owen is one of those artists whose work is strongest when it seems to be the stuff of waking dreams... familiar yet surreal. 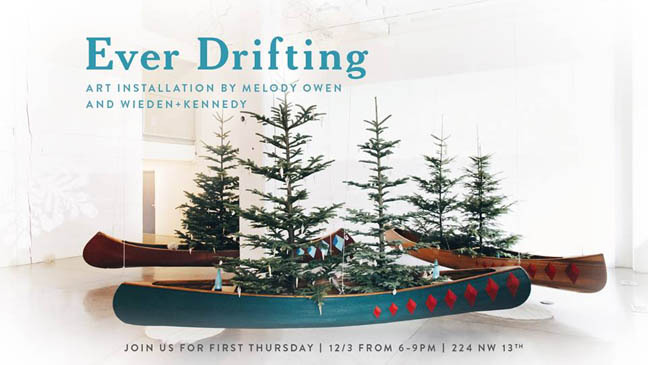 Her Ever Drifting exhibition with its conifers and boats looks like a great holiday installation at W+K. 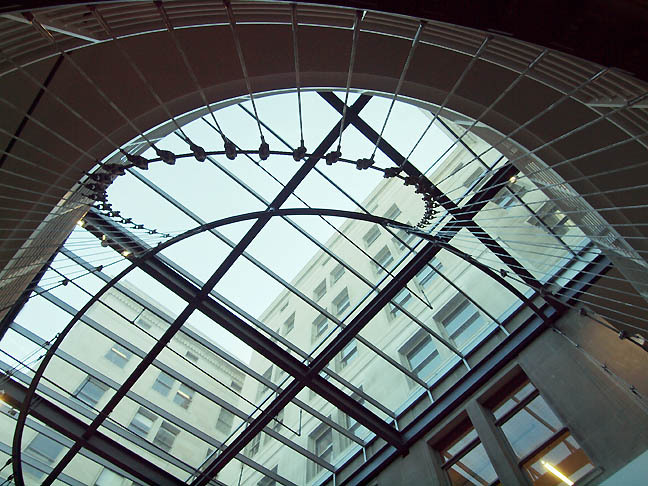 More Portland buildings with extensive and often under used lobbies should partner with artists like this.